MiteGone® evaporator pads were designed in 1994 by the beekeeper - for the beekeeper. 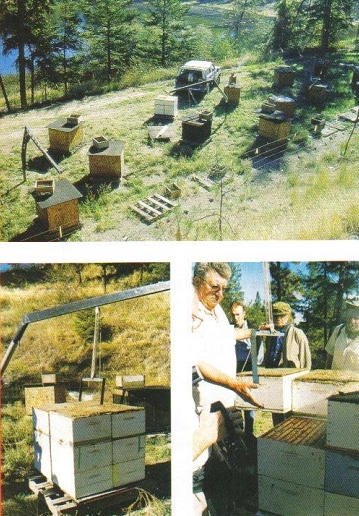 The pads have been successfully tested for six years in commercial use by local beekeepers in the Okanagan Valley of British Columbia, Canada. Scientific evaluations were completed since the summer of 2000, and can be read by clicking here. Bill holds a patent for the biological control of Varroa using the fungus Hirsutella Thompsonii. In search of a better method for treating varroa mites with formic acid, that was suitable for a commercial operation, he evaluated many existing methods of Bee Mite Treatments and compiled a set of principles for successful treatment. The formic acid treatment he developed is now used in Canada, USA, New Zealand, Argentina and Europe. Since 2002, thirty seminars have been held in New Zealand. Bill has held 50 seminars and has spoken in 4 states and in both national conventions in the USA. 20 seminars were held in Canada, 5 in Europe, and 7 in Argentina. These seminars are now available: ANYWHERE /ANY TIME through the VIDEO or POWERPOINT and PHONE QUESTION PERIOD.